There are several robotic mowers that can trim your lawn so you don’t have to worry about breaking a sweat or even getting out of your chair. The Flymo robotic lawnmower 1200R is one of these. In this review, we’ll take a closer look at the Flymo mower to see just what it can, or cannot, do. It’s among the most affordable, yet more than adequate for most homeowners. It also has great features like bump-and-go, PIN code access, and an anti-theft alarm system. 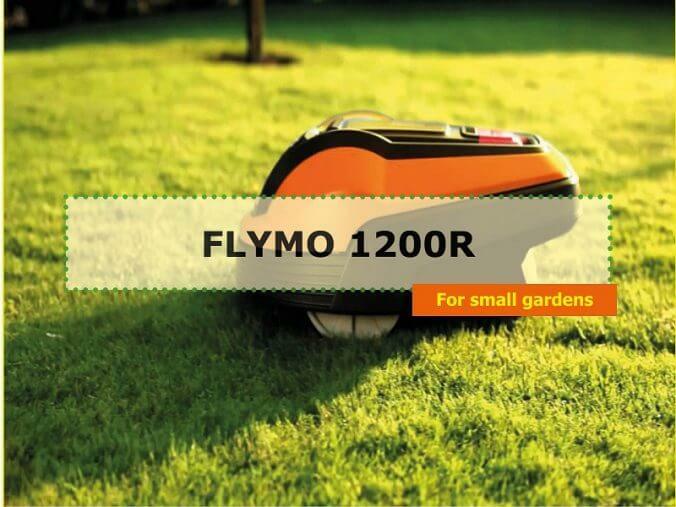 The Flymo 1200R is perfect for up to 400 m² lawn. The lawn mower has mulching capability and adjustable cutting height. With the help of 8V lithium-ion battery, Flymo 1200R can mow for 60 minutes without charging. The Flymo has built-in safety controls to keep you, your family, and your pets safe. 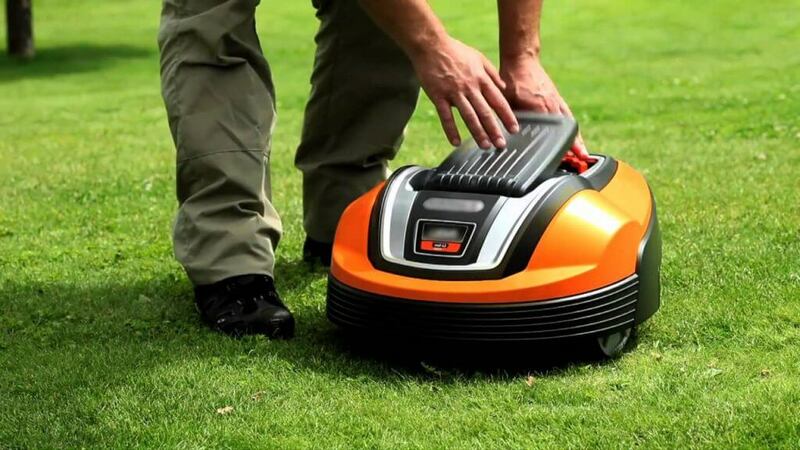 The Flymo automatic lawn mower can cut efficiently at up to 14-degree angles to hug the slope of your lawn. If you have steeper grades or hillocks to trim, you can pick up the lightweight mower and reposition it where you need it. Like most robotic mowers, the 1200R doesn’t follow a preset pattern, but covers the area randomly. The Flymo will map out the area on its own for a logical path, saving you time and money on electricity. It can utilize basic wire loops and internal sensors to find its way. Among other things, the 1200R lets you adjust the height at which it cuts, anywhere from 2 to 5 cm. It helps to provide a more lush-looking yard if you can keep grass throughout the entire area at a uniform height. Be advised, however, that the Flymo can’t handle very tall grass, so if you’ve let it get out of control, you’ll have to cut it down with a conventional mower before you can start using the 1200R. Cutting the lawn to finer bits allows the clippings to settle between the growing blades of grass. The clippings decompose naturally to form a compost that provides just the right nutrients for grass to grow, while also retaining moisture and reducing evaporation. These factors work to ensure you get a green lawn even in the warmer weather and dry spells. The Flymo 1200R doesn’t leave lines and tire marks like a traditional mower. Flymo’s automatic lawn mower will also chew up any stray sticks that it comes across. But it would be easier on the mower if you picked up the area first. The Flymo has built-in safety controls to keep you, your family, and your pets safe. Should the mower find itself tipped beyond a certain angle, it will automatically stop running so that nobody is cut. It also comes with a big red STOP button so you can shut it off manually when necessary. It’s designed with a “bump” feature, so if it hits something, it immediately backs off and reroutes to a different direction. To prevent anyone else, such as a small child, thief, or over-zealous neighbor from using the mower without your authorization, it will give off an alarm if any tries to remove it. The Flymo also requires a PIN code before it can be activated. You also have to use the PIN code to change its settings, but that will also prevent anyone else from tinkering with your mower. You need to set a perimeter wire to confine the automatic lawn mower. However, this wire must be just the right height at all points, or the 1200R may run right over it or even cut it. The Flymo robotic lawn mower doesn’t take sharp turns particularly well. You’ll need to pick up any small objects which could be damaged or ruin the mower blade. 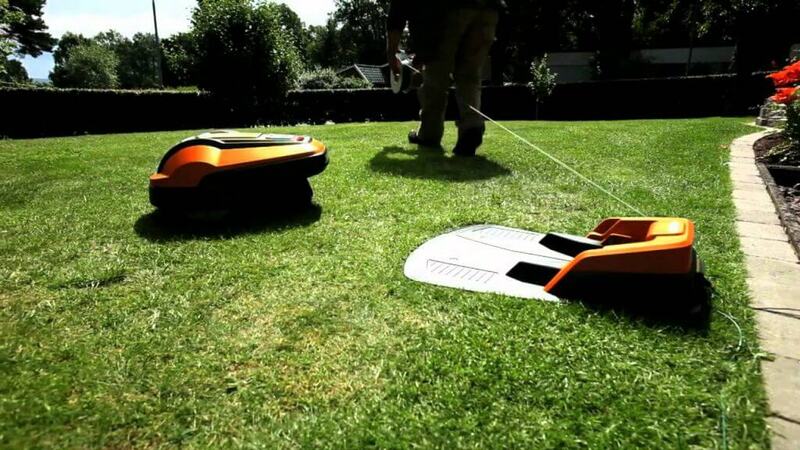 The Flymo robotic lawn mower is limited to both a modest cutting area and only slightly pitched lawns. If you have more complex needs, you’ll need a different mower. The 1200R is designed for the average home, and in that comfortable environment it’s a great value that performs very well.